The market for wild caught pelts for the fur industry is depressed this year. A big raccoon which would have been worth 35 dollars a few years ago when Russian crude was selling for $100 a barrel will sell this year for maybe five-bucks if you can find a fur buyer who is even open for business. 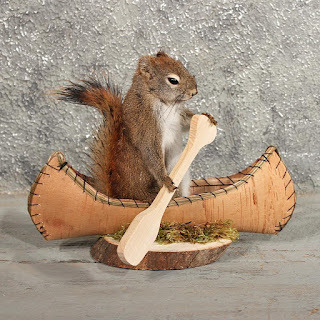 Life like taxidermy work is fine art. But trapping is more than a way to make money, it’s an outdoor sport every bit as important to me as fishing, shooting and hunting. It’s a way to keep fur bearing animal populations under control and healthy. Whether I sell my pelts for $10 or $100 makes little difference at the end of the season. Still, as a guy who picks up lost pennies when I spot one in a parking lot, I’d like to get the most money possible for my effort. There are other businesses using wild-caught animals, besides furriers. I’ve sold pelts to fly-tiers and crafters. There’s a limited demand for raccoon and opossum meat. Mepps lures will buy the tails from legally harvested squirrels to make their spinners. Another business often buying wild animals are taxidermists. Some taxidermists only mount animals for hunters. A hunter bags a big buck or nails a coyote while on his or her deer stand then hauls it down to Joe’s Stuffing Store and pays Joe to bring it back to life - almost. Squirrels are often used as novelty items. However, many taxidermists also mount animals to sell to non-sportsmen. There’s a market for wildlife displays in offices, dens, restaurants and other locations, just as there is a market for man-made sculptures, paintings and other artwork. Those animals have to come from somewhere. The price of furs is strictly based on supply and demand. Though the faltering economies in Russia and China this year undercut demand and prices for wild pelts for fashion, Joe’s Stuffing Store may still need a good number of animals to produce his boutique displays. 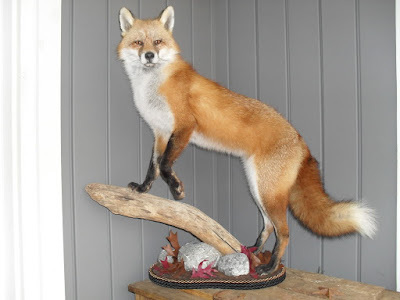 I’ve been selling a variety of animals to a taxidermy studio in Lake County for several years. In the past this taxidermist has paid up to $15 per raccoon, regardless of size, he also buys a few opossums, foxes, coyotes as well as squirrels, mink, weasels, rabbits and chipmunks as long as they were legally obtained. A fox is a rare catch for me. I harvested one fox and one mink this year on my trap line. Both were surprises since I was not trapping specifically for either. Fox are few and far these days, forced out by habitat changes and coyotes. Mink are more numerous, but since I don’t trap in or near water most of the time, finding one in a dry land raccoon trap is equally rare. Instead of pelting them out and selling them into the fur trade where I would have been lucky to garner fifteen dollars for both animals, I froze them whole and took them to the taxidermist. The taxidermist paid $30 for both animals. I’m not rich, but it beats picking up pennies.